3.93" x 8.46" - 8.46" x 14.0"
The RICOH SP 3600SF monochrome MFP is small enough to fit on a desktop, but powerful enough to simplify how you manage and share information. Innovative LED print technology produces high quality at a low price per page, and mobile printing makes it easy for workers to collaborate from anywhere. Who needs the hassle of print drivers? Not you. With the RICOH SP 3600SF, you can print and share images, documents and photographs using the RICOH Smart Device Print&Scan app from your iPhone, iPad or Android - smart phone or tablet. Or, carry work with you on a USB device and plug it into a multifunction printer (MFP). With standard duplex printing, you can use less paper. Double down again with the printer's EPEATSilver rating (EPEAT is a global environmental rating system for electronic products) and ENERGY STAR certification. And, you can easily recycle toner cartridges and containers. 8.5" × 14" - 5.5" × 8.5" (A4 - A5), Custom: up to 8.5" x 35.4"
The Ricoh SP 3600DN/SP 3600SF/SP 3610SF ships with starter toner that yields 1,500 pages (ISO/IEC 19752). 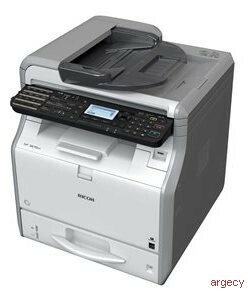 The Ricoh SP 3600DN, SP 3600SF/SP 3610SF are under warranty against defects for a period of one year from the date of purchase. Consumables are under warranty for a period of 90 days from the date of purchase or until depleted, whichever comes first. Please refer to warranty documents shipped with the product for more details.